I've been traveling around NYC and the Hamptons for the past two weeks. Two planes, four busses and many Uber rides later, I’m so happy to be home again. All of this schlepping has been quite exhausting and while comfort in fashion has never really been a priority for me, it was on this trip. I realized this when I was packing up the night before the final leg of my East Coast adventure, while I was choosing what to wear on the Hampton Luxury Liner back to the city. If you've never heard of the Luxury Liner and think it sounds like a fancy way to travel to Manhattan, let me clear things up. It's a slightly upgraded bus with wi-fi and leather seats. Their definition of luxury and mine (and probably yours) are slightly different. At the end of the day, luxury or not, busses generally aren't the most comfortable or chic way to travel, but that doesn't mean that what you wear can't be. At least by Hampton Luxury Liner standards (as opposed to red carpet, hotel pool or lazy brunch standards), I felt really put together. I could live in linen pants. Just an FYI, after this borderline life-changing fashion revelation, a quick Google search showed I am not the first person to have this thought. I'm pretty sure (no pun intended) Hey Pretty Thing first had the idea in 2010. So, when you’re finished reading this and checking out my favorite linen pants (and perhaps even treating yourself to a pair or two, just click on the images to shop), take a look at her site. What could say summer sweatpants better than white linen and a drawstring? And as a bonus, they're machine washable. These James Perse cotton-linen blend trousers are comfortable and casual with a sporty cuffed hem. Wear them with sneakers, flip flops, or even high heels. If wide-leg isn't your style, but you want something sleek and comfortable, these James Perse pants are it. The material is even treated with a special fabric softener to make them feel extra soft and lived in- kind of like your favorite sweat pants. Whether you wear them on a runway or to a restaurant, these Facetasm trousers are so stylish. I also love the fact that they're navy, which a a great alternative if you have way too much black in your wardrobe already. 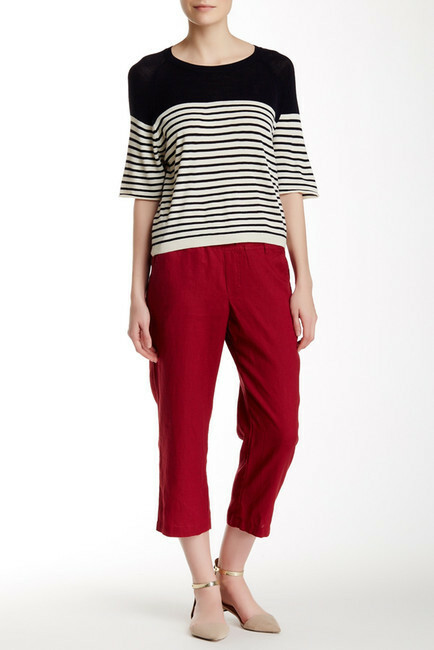 These Allen Allen cropped pants are equally bold and boat. Wear them with a striped shirt for a nautical look. Featuring wide legs with a high slit, these BLVD pants are super unique and almost look like a skirt. Prepare to thank everyone for the compliments you'll get wearing them. These Vince stretch-linen pants are easy to move around in and easy to style. A thicker linen fabric, you can wear them for the end of summer into Fall. If there is one pair of pants on this list that checks the stylish, versatile, practical, comfortable and (relatively) affordable boxes, these Allen Allen pants are it. Completely classic, you can wear them season after season.